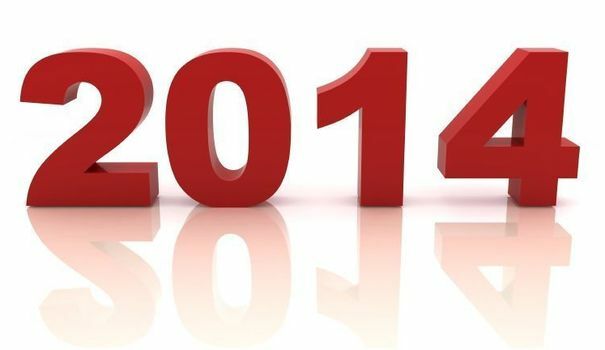 Yes, I know, I’m a little tardy with my annual end-of-year post counting my blessings over the preceding twelve months. I have no excuse. There are just as many blessings to enumerate, but the holiday break ended up being just that, a break. For some reason I could not muster the wherewithal to sit down at my computer. (Given that my last post on this humble blog was in August, you may wonder just how long my “break” was.) Anyway, I made similar “progress” on my seventh novel, If at First You Succeed. Bu I’m pleased to report that my sedentary ways are behind me and I am emerging from the holiday haze! Part of January 2016 was dedicated to persuading other writers I know and respect to read the manuscript for One Brother Shy, and offer their old pal Terry a positive blurb for the then new novel. I was thrilled when Joe Kertes, Gary Barwin, Susan Juby, and Steve Patterson all kindly agreed. No money changed hands. You can find their lovely comments gracing the back cover of One Brother Shy. I taught my eight-week Humour Writing course early in the year for the University of Toronto’s School of Continuing Studies Creative Writing program. Always fun. In February we lost Canadian treasure and three-time Leacock Medalist Stuart McLean. We weren’t ready. When my first novel won the 2008 Leacock Medal, in my impromptu acceptance remarks, I thanked Stuart’s two main characters from his classic Vinyl Cafe stories, Dave and Morley, for having a particularly quiet and uneventful year. I did that because I suspected that had Stuart released a new collections of stories that year, I would not have won. I was interviewed for the CBC story when news of Stuart’s passing broke. I gave 83 book talks in 2017, down somewhat from my high-water mark of 142 a few years ago. But it was wonderful to visit parts of my city, province, and country I don’t get to very often. Highlights would include a ten day tour of the Gulf Islands off the coast of BC in April, a lecture to the Hamilton Association of the Advancement of Literature, Science and Art, a “Google Talk” at Google’s Canadian headquarters, a keynote address at the Women in Nuclear conference, along with festival appearances in Gananoque, Wakefield, River John (Nova Scotia), Eden Mills, Lunenburg, Westport, Whistler, Stratford and Toronto (IFOA). I even Skyped in to a book club in Kinshaha in the Democratic Republic of the Congo. In March, a photo appeared in my Twitter and Facebook streams showing our Premier, Kathleen Wynne, in a Guelph bookstore heading to the cash register with two of my novels. I was already a big supporter of Premier Wynne. Imagine how I feel about her now! Also in March, I started to podcast One Brother Shy in anticipation of the novel’s release in May. In late May, One Brother Shy was released and earned spots on several bestsellers lists. There were positive reviews in a few major newspapers including the Winnipeg Free Press and the Toronto Star. I also did several media interviews to promote the novel including on Global Television and CBC Radio’s Q.
I spent some time on CBC Radio’s The Current in 2017 including in August talking about politics in general and the Trump presidency in particular and then last month for a look back at world events over the year. In July I was thrilled to be invited to join the faculty of the famed Iceland Writers Retreat running for a week this coming April. I’ve always wanted to visit Iceland. In August I was commissioned by Maclean’s to write a piece of fiction about the Trump Presidency might end. Now that was fun. In November, I spoke at the launch of the One Brother Shy Daisy audio version for the CNIB. It was such a wonderful hosted at The Hub, a CNIB community “hub” in Toronto. I added to my writing obligations in 2017 when I became the humour columnist for Legion Magazine as well as a columnist for Leaside Life magazine. 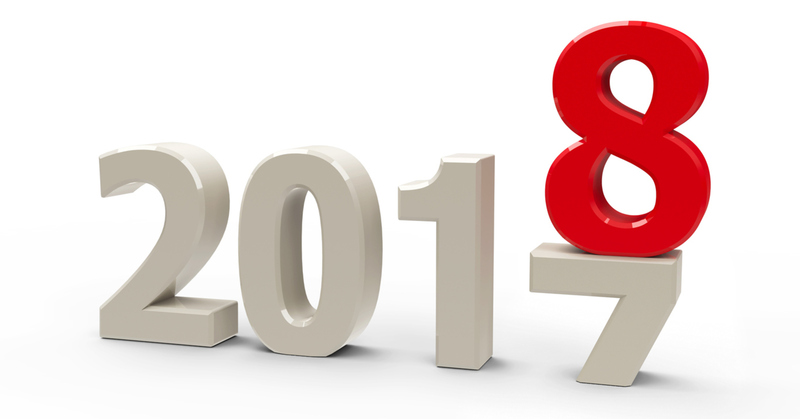 Both of these will continue in 2018. In November, I spent a week sequestered in a hotel in Collingwood working on my seventh novel, If at First You Succeed. I’ve finished my chapter-by-chapter outline and have just started the manuscript. 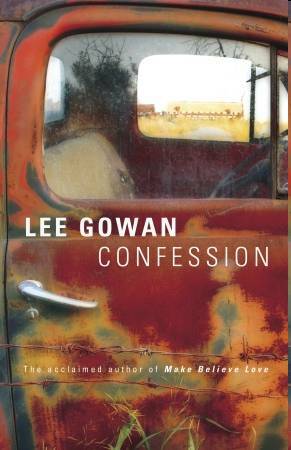 McClelland & Stewart expects to release the novel in the spring of 2019. 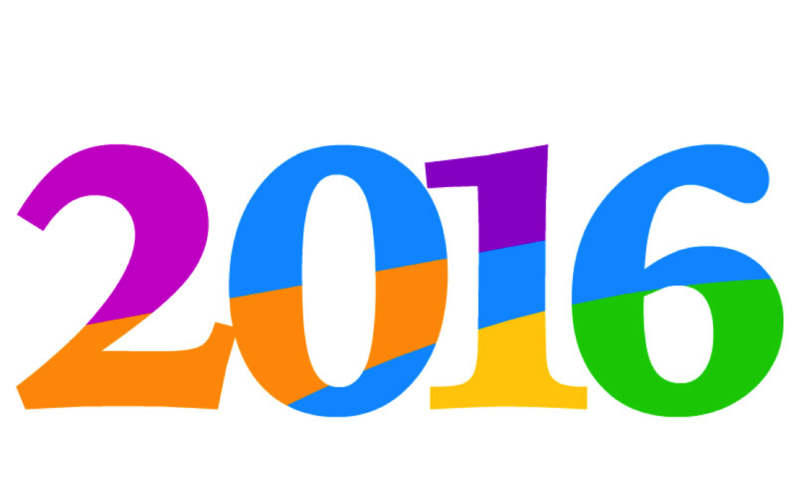 So it was an eventful and wonderful year in my writerly life. Looking ahead, I’ll be doing more traveling in 2018 with writing-related trips already planned for Iceland, Yellowknife, and Woody Point (Newfoundland), with a few dozen appearances already booked. As well, I should have my seventh novel, If at First You Succeed, finished by the summer. I’m about to start teaching my eight-week Humour Writing course again for the University of Toronto’s School of Continuing Studies Creative Writing program. So life is full and good, and I couldn’t be happier. Onwards! Starting next Wednesday evening, September 14th,Â I’ll be teaching a course at the University of Toronto School of Continuing Studies in the Creative Writing program. 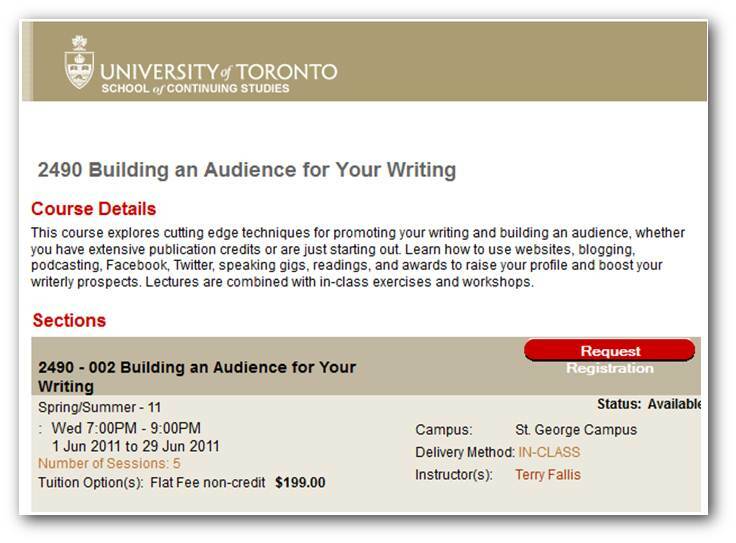 The course is called How to Build an Audience for Your Writing. It runs for five Wednesday evenings and covers a range of techniques including blogging, podcasting, YouTube, Facebook, speaking gigs/readings, Twitter, and awards. The last session is a class reading, which was really wonderful in the first class. This is the second time I’ve taught the course. Last term we had about 25 writers in the class. It looks like the September enrollment is a little lighter, so there’s still plenty of room if you’d like to register. Click here or on the graphic below for more info on the course and how to register. Why not give it a shot? 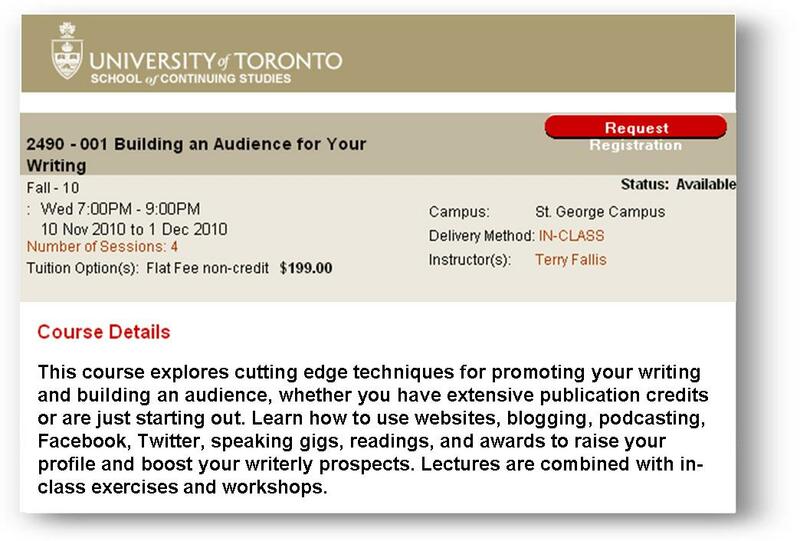 I’ll be teaching a five week course on Wednesday nights starting June 1st for the University of Toronto’s School of Continuing Studies as part of their Creative Writing program. 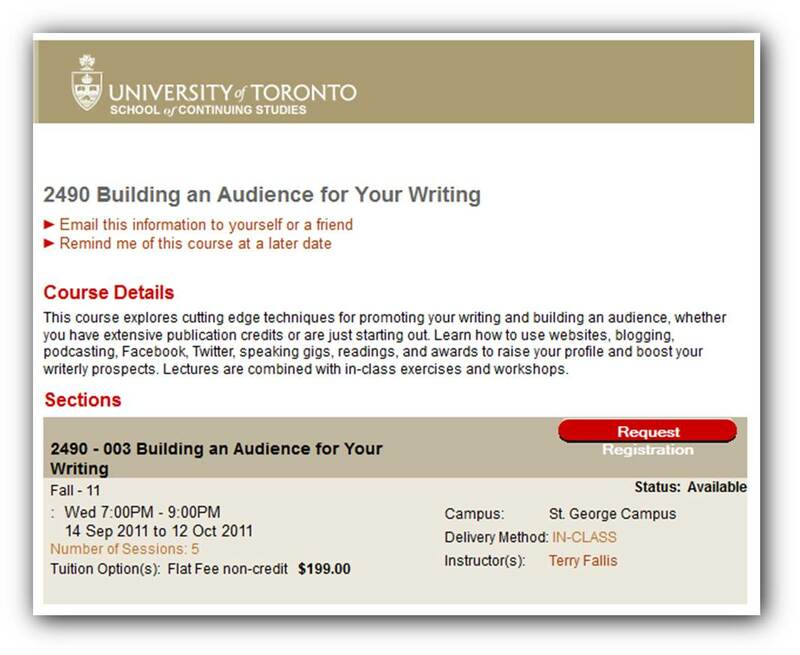 The course is less about writing than it is about how to build an audience for your work. We’ll be exploring various ways to elevate the profile of your writing including blogging, podcasting, Twitter, speaking gigs, readings, and even awards. So if you’ve written the great Canadian novel but can’t get anyone to read it, you just might learn a thing or two to help you get noticed. I developed the course and this will be the first time I’ve actually taught it, although “taught” seems too formal a word. So spread the news or sign up yourself. I think we’ll have some laughs along the way. There remain a few spots open in the evening course I’m teaching at the University of Toronto’s School of Continuing Studies. As you can see from the description above, the course is all about using social media and other techniques toÂ build an audience for your writing, whether you’re published or not. The course is only four Wednesday night sessions and starts on November 10th. You can register online here.